The CAAT Pension Plan today announced a 11.5% rate of return net of investment management fees of 77 basis points for the year ended December 31, 2014.The Plan’s net assets increased to $8 billion from $7.1 billion the previous year. In its valuation filed as at January 1, 2015, the CAAT Pension Plan is 107.2 % funded on a going-concern basis with a funding reserve of $773 million. During the past five years, the Plan has earned an annualized rate of return of 10.5% net of investment management fees. Contributions to the CAAT Plan were $417 million in 2014, while net income from investments was $808 million. The Plan paid $369 million in pension benefits for the year. The CAAT Pension Plan has 40,000 members – 24,700 are employed in the Ontario college system, which comprises 24 colleges and 12 associated employers, and 15,300 members who are retired or have a deferred pension. The average annual lifetime pension for retired members and survivors is $25,800. In 2014, members on average retired at age 62.4 after 23.3 years of pensionable service. The 11.5% rate of return net of investment management fees outperformed the policy benchmark by 1.4%, adding value of $96 million. The CAAT Plan seeks to be the pension plan of choice for single-employer Ontario university pension plans interested in joining a multi-employer, jointly sponsored plan in the sector. The postsecondary education alignment and similar demographic profile of university and college employees makes the university plans an ideal fit with the CAAT Plan’s existing asset and liability funding structures. The CAAT Plan has been in discussions with individual universities, employer and faculty associations, and government officials, about building a postsecondary sector pension plan that leverages the Plan’s infrastructure and experience, reducing costs and risks for all stakeholders. Created at the same time as the Ontario college system in 1967, the CAAT Plan assumed its current jointly sponsored governance structure in 1995. The CAAT Plan is a defined benefit pension plan with equal cost sharing. Decisions about benefits, contribution rates, and investment risk are also shared equally by members and employers. The Plan is sponsored by Colleges Ontario on behalf of the college boards of governors, Ontario College Administrative Staff Association (OCASA), and Ontario Public Service Employees Union (OPSEU). The 2014 CAAT Pension Plan Annual Report will be available on the Plan website by May 11. 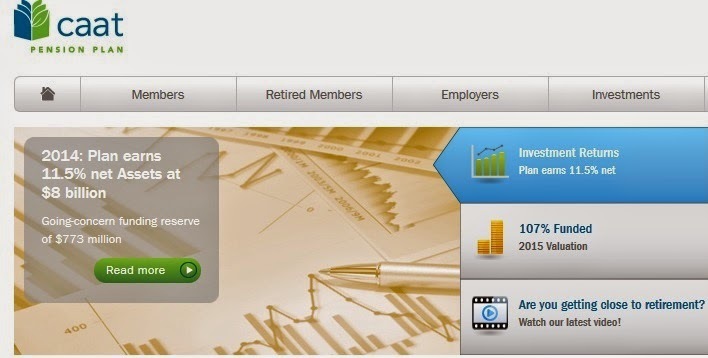 The CAAT Pension Plan is a jointly-governed pension plan. This means that employers and employees together share responsibility for the stability and security of the Plan (including the cost). This governance model fosters cooperation and flexibility, and encourages prudent and responsible decision-making. The Sponsors of the Plan (OCASA and OPSEU representing employees and Colleges Ontario representing employers) appoint representatives to the Board of Trustees and Sponsors’ Committee. 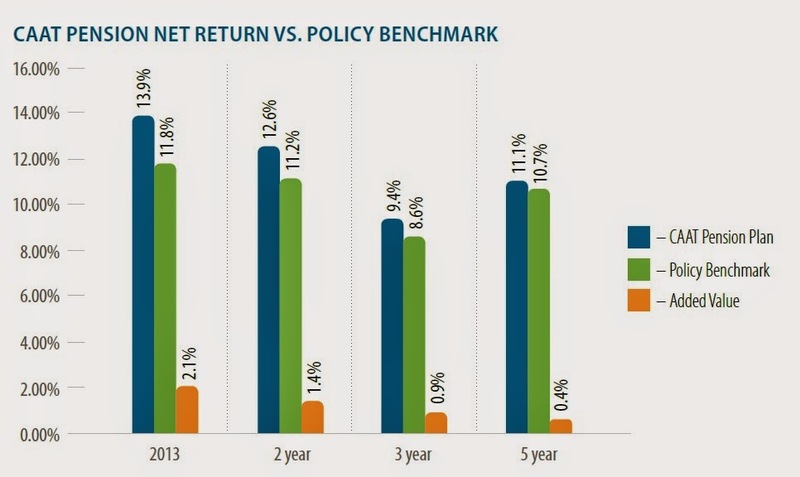 As far as investment performance, net of fees, the Plan managed to deliver a solid return of 11.5% last year, beating its benchmark (policy) portfolio by 1.4%. I want to take a minute here to go over their policy portfolio using information from CAAT's 2013 Annual Report. As I was reading CAAT's 2013 Annual Report last night in bed (I know, I'm weird but I sleep like a baby! ), a few things struck me. First, CAAT severely underperformed its Private Equity benchmark in 2013 because the benchmark (MSCI All Cap World Index + 3%) isn't easy to beat, especially when global stocks are surging. Also, the J-curve effect in Private Equity makes it harder to beat this benchmark because these investments are valued at acquisition-cost and it takes several years to realize gains on these investments. Canadian equities returned 7.3 per cent in the fourth quarter which brought the 2013 return to 13.0 per cent. The median returns were 8.3 per cent for the quarter and 19.0 per cent for the year. The best performing S&P/TSX sectors were Health Care (+72.1 per cent), Consumer Discretionary (+43.0per cent) and Industrials (+37.5 per cent). The worst performing sectors were Materials (-29.1 per cent), utilities (-4.1 per cent) and Telecom Services (+13.1 per cent). Large cap stocks (S&P/TSX 60 Index) returned 13.3 per cent, outperforming small cap stocks (S&P/TSX SmallCap Index) which returned 7.6 per cent during 2013. 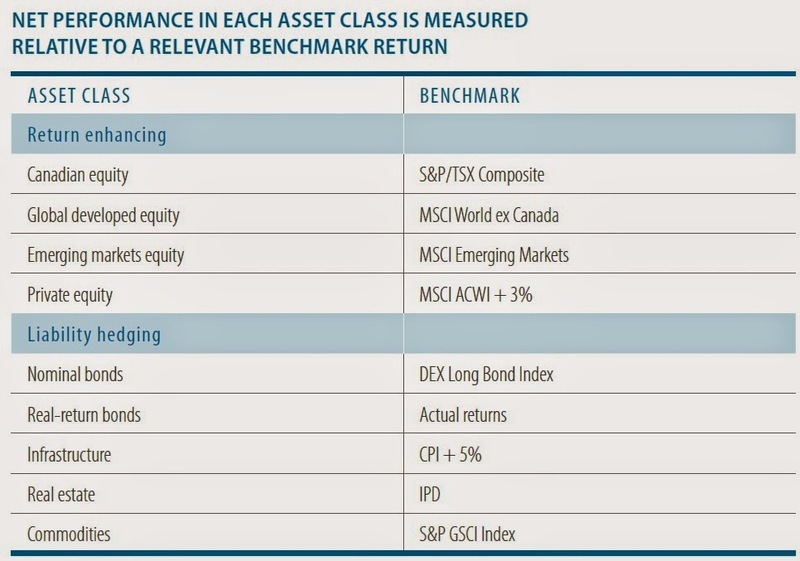 Value stocks outperformed growth stocks as measured by the S&P Canada BMI Value and Growth indices, which returned 17.2 per cent and 9.1 per cent respectively in 2013. A typical balanced pension portfolio returned 12.8 per cent in 2013. The median return offered by managers of the Canadian Pooled Balanced Universe was 6.5 per cent for the quarter and 16.2 per cent for the year. 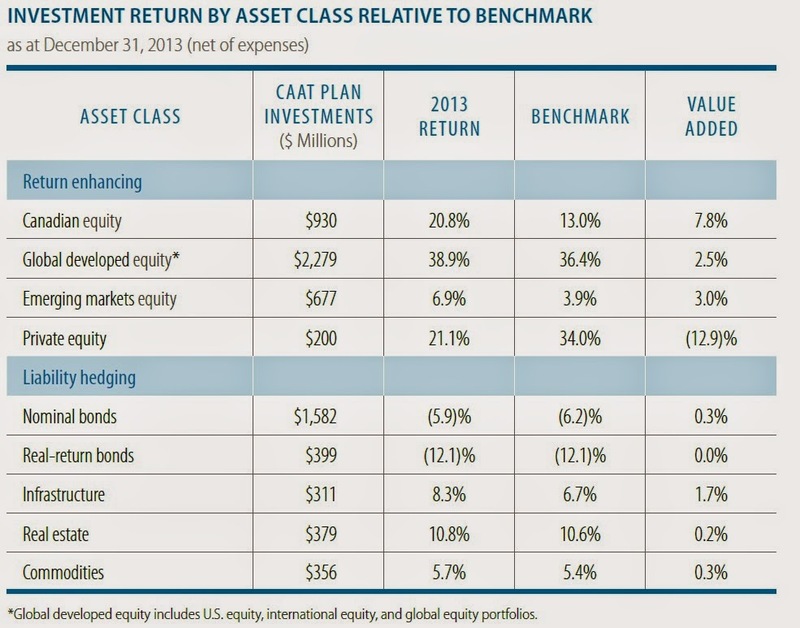 Of course, if you look closely at CAAT's asset mix, you will notice they are a lot more diversified than the typical balanced fund. Julie Cays, Kevin Fahey and Asif Haque, my former colleague at PSP, are doing a great job managing investments at CAAT. Unfortunately, CAAT's 2014 Annual Report will only be made available by May 11th, which makes it impossible for me to delve deeply into their latest results. I highly recommend CAAT adopts a new approach of making available its annual report at the same time as it releases its results, just like Ontario Teachers' does (everyone should do this so we can properly examine their results). And since CAAT is growing but still a relatively small plan, its approach is to farm out most of its investments to external managers. Not surprisingly, one of their biggest investments is an allocation to Bridgewater's Pure Alpha II Fund which is up 14% so far this year mostly owing to a big bet on the surging greenback (all of which I predicted back in October 2014; Ray is on my distribution list). CAAT has the advantage of being fairly small relative to its bigger Canadian peers, and unlike HOOPP, its managers have opted to farm out most of their investments (read more about the CAAT and Optrust edge). This strategy works when you are able to choose the right managers but it also poses risks, the least of which is manager selection risk, and they have to make sure they negotiate the fees carefully because as they grow, so do those fees, increasing the costs of the plan. Even now, CAAT is forking over fees to external managers but if they gt to be ten times their size, those fees can pay some nice salaries to bring some of those assets internally. As the plan grows in size, so will those fees, and so will the pressure to bring more assets internally. Again, CAAT's investment team has been posting solid returns, adding value over its policy portfolio over the last five years. Moreover, its governance model has allowed it to beef up its fully funded status, which is what ultimately counts. Also, as Julie Cays, CAAT's CIO, once told me, there is a lot of knowledge leverage that goes along to allocating money to top global funds. Our fees were 77 basis points – which incidentally includes over 20 basis points paid as fees for outperformance to managers with performance based fee arrangements. Once our annual report is available I’d be happy to chat about 2014. I look forward to reading CAAT's 2014 Annual Report when it becomes available by May 11th. Those of you who want to learn more about CAAT should take the time to carefully read its 2013 Annual Report and listen to its senior managers discuss the plan's results and characteristics here. Also, CAAT is an excellent multi employer defined-benefit plan which adheres to the highest standards of pension governance. I highly recommend all Canadian universities seriously consider having their defined-benefit plans managed by CAAT. Don't just look at their returns, which are excellent, think of the advantages of pooling your assets with those of other university pension plans and having those assets managed by professional pension fund managers who will properly diversify across public and private markets. Below, an introduction to the CAAT Pension Plan and OCASA's role. CAAT desperately needs to update its videos on YouTube and allow embed codes on their latest videos on their website (all public pension funds need to get with the times, we live in 2015, not 1995!! ).